Abstract: Prince is here to share what he has learned and read and written and watched and observed: “So let’s put our names down for his workshop and be there to enjoy and come away with a load of takeaways. The commonalities between negotiation and debate, the underlying thought process, formulating thoughts, ad-libbing and how to present formulated thoughts. The workshop will use interactive techniques such as pair work, group exercises and Q&A. Abstract: “Diplomacy is the art of letting someone else have your way.” (Sir David Frost) This may be true, but how to negotiate the best outcome in a particular situation? Negotiations are required in all facets of life, both personal and professional. This interactive workshop will provide the tools to navigate the tricky steps involved. Negotiations 101: Steps to Success will run the gamut from preparing, to doing (the actual negotiating), to reviewing (post-negotiation stocktaking). Whilst predominantly focused on negotiations in the professional realm and within Toastmasters, there will be opportunity for discussion on personal negotiations and how to transfer lessons learned across contexts. With short videos covering tips from business leaders and negotiation pros, to “hot-seat” role play, this interactive session will have you negotiating in no time. Abstract: Video is becoming increasingly critical as a leadership and communication tool on social networks and platforms like Facebook, LinkedIn, and Youtube, as well as on personal websites and blogs/vlogs. Indeed, the new Pathways program includes projects involving the creation of blogs, webinars, and podcasts. A simple technique to add interest and special effects to videos is the green screen. Workshop participants will actively participate in producing a green screen video during the workshop. Abstract: “Oops moments” for a presenter are those times when you wish you weren’t there and so does the audience. When things go wrong, they can annoy, bore, amuse (for the wrong reasons) or lose you your audience. They are mostly preventable and often manageable – if you know how. This workshop shows you the five reasons why. You will also learn how to better assess the risks of working with ‘props’ – support material – and make your presentations more memorable and interesting for your audience. Abstract: Computer games are essentially a social activity. What can we learn from computer games about leadership, and about how to create an engaging environment for our team members? Members who are as human as we are, and who have different levels of expertise and different personalities. The workshop will focus on an aspect of computer game design which can help us be better leaders. Abstract: This workshop is designed as a boot camp to support and facilitate access of women to the competition podium using interactive techniques in which speeches will be presented, evaluated, reworked and re-presented, in a positive, proactive and encouraging environment. Because Women belong on the Podium, women and men alike, come and join us for this fun bootcamp on getting up there, fearless, stressless and powerful! Wop wop wop! Abstract: What will happen when you dare to roll out your REAL high impact mode? Learn how to KNOCK OUT your team members with your high-powered leadership, and not with crafty punches! This workshop is for enthusiastic Toastmasters who wish to go one step further in their leadership journey, by taking on more responsibilities in their club, Area, Division, or District. Carol will be presenting the idea that our strong points can also sometimes be our worst enemies. After the creation of a fun, clear frame to form a solid group attitude, she will be leading us through a quick-fire personal behavioral analysis, with respectful feedback as to how others perceive us in different contexts of our life. The second part of the workshop deals with how we express these strong points and the tempering of the aspects of our personality which may be considered less conducive to a leadership context. Abstract: Have you ever been lulled to sleep by a speaker presenting an endless litany of technicalities? Or buried under an avalanche of information? Often, people tend to think that this is necessary to present technical, financial, scientific or organizational information without undue bias. But is this really the natural state? Or could it be that there are no dry topics? Presentations are not an end but a means—a means to communicate. If the information is not understood, the opportunity is wasted. In this workshop, we’ll discover how complex topics can inspire rather than overwhelm the audience and how ostensibly “dry” information can be transported in an exciting fashion. As the Greek philosopher and essayist Plutarch observed that “the mind is not a vessel to be filled with information, but wood that needs kindling”, let’s start some fires! Abstract: Leaders today communicate more and more virtually. Social media provides fantastic opportunities to reach new audiences, potentially every person on the planet! Though a live speech may be given just once, online, it may live on forever. But with increased visibility comes increased risk. The social media genie is out of the bottle. Who can’t think of an example where social media has damaged someone’s message or even their leadership? How do we make our story likeable and shareable online? Create quotes that stick (Twitter), images that connect (Facebook) and stories that inspire (Instagram)? Communicate responsibly on social media? Persuade the social media genie to be kind to our story? In this workshop, we will explore the do’s and don’ts of bringing your message to online audiences! Abstract: Many members in Toastmasters speak about the importance of mentoring; unfortunately only few practice it in their clubs. From a recent survey run in D109 it emerges that 93% of the clubs would like to improve their mentoring program. In this workshop you will learn how different clubs run the mentoring program. You will have the opportunity to collect best practices to improve the program in your own club. Steal the best-kept Secret of Toastmasters by participating to the Mentoring Workshop. As Toastmasters we know that the words we use and how we use them matter. And sometimes the way we communicate may cause certain conflicts. Conflict is present in our lives and there are two ways of seeing it: as a negative aspect or a positive one that will foster new opportunities. We tend to avoid conflict at all cost. During this workshop we will see how to resolve it at an early stage using the Nonviolent Communication (NVC). The NVC was developed by Marshal Rosenberg (1992). This tool has proven to be very simple, yet very effective! Abstract: This workshop is a mandatory COT session for those who would like to validate the second round of club officer training for the 2018-2019 Toastmaster cycle. The purpose of the workshop is to discuss Pathways and find the answers to your questions about Pathways and Base Camp. Todd, the session moderator, is an experienced panel leader and will demonstrate his expertise in panel discussion techniques during this session. Abstract: Motivation is a term that describes why a person does or doesn’t do something. Motivation is defined as a process that initiates, guides and maintains desired behaviors. But it fades quickly. Like adrenaline, once its explosive strength is exhausted, motivation disappears, leaving us with the hard work. Anyone who has ever wanted to achieve a goal must certainly realize that the mere desire to achieve something is not enough. To achieve a goal, you have to be able to persist through obstacles and possess the resiliency to move forward despite the problems. If the goal is the destination, motivation is the fuel you need to get there. Successful leaders must understand their own inner motivators, so they can support their team members to motivate themselves to achieve their goals. In this workshop, you’ll learn how to motivate yourself in order to lead by example. Abstract: This workshop is a mandatory COT session for those who would like to validate the second round of club officer training for the 2018-2019 Toastmaster cycle. A key principle of psychology maintains that the whole is greater than the sum of its parts. As a member of the club’s executive committee, each officer brings individual strengths, perspective and abilities to his or her role. Working as a cohesive team creates something more than what can be done through individual effort. The purpose of this workshop is to provide tips and best practices for building a successful Toastmasters club. Abstract: What do Quantum Physics, Project Management and Leadership have in common and why should you care? This workshop starts simple: What is a project? What is project management? Then we move into what is success? Who defines it? How do you measure it? What are the pitfalls and how to avoid them? And finally, why the title of this workshop is wrong and how to fix it! Abstract: Leadership training was pronounced an additional educational track in the TMI educational program in 2005. Although leadership roles at different levels had always been part of the journey to DTM, the Leadership Manual emphasized that there are many smaller leadership opportunities in meetings which are not always recognized as such. In this workshop, participants will learn how to apply their Toastmasters leadership experiences to the real world. They will leave inspired to take on any leadership role at any TM level and understand how to apply these experiences in their own lives outside Toastmasters. Abstract: Project management brings a unique focus shaped by the goals, resources and schedule of each project. Project management processes fall into five groups: Initiating, Planning, Executing, Monitoring and Controlling, Closing. High Performance Leadership features five projects offering instruction and practice in such vital leadership areas as developing a vision, goal-setting and planning, developing plans and strategies, and team-building. The workshop will allow to understand the PM phases to use them conscientiously to develop a project of HPL. During the practice you will start to work on your HPL. 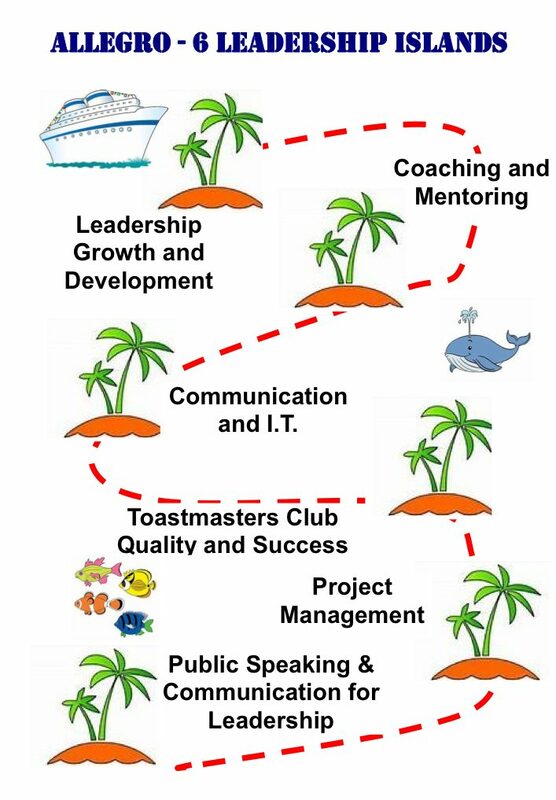 Abstract: “From Speaker to Trainer” is a training course in the official Toastmasters Success Communication Series. Indeed, speaking and training are not the same thing, and require different competencies! This program contains 4 hours and 45 minutes of content, not including breaks. It’s a challenging, but rewarding endeavor. Rob, who recently conducted Speaker to Trainer for his HPL, will explain why this training course is so beneficial to Toastmasters officers and members, as well as professional speakers. He will share tricks and tips on how to conduct this training course successfully. Copyright © 2019 ALLeGRO! Toastmasters Floating Academy. Powered by WordPress and Epic Base.